Renewed hopes for a China-US trade deal was headline news this week. The two countries claimed progress in talks to end their trade war. According to the Financial Times, Senior US and Chinese officials have resolved most key issues in their trade talks but are still discussing how to implement and enforce the agreement. 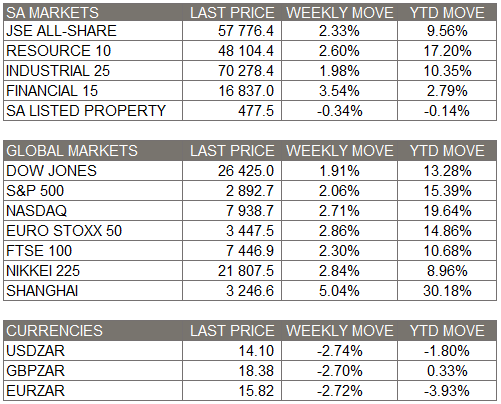 Both countries came out with strong economic data during the week, which spilled over to equity markets. Chinese manufacturing PMI came out at 50.5, rising from 49.2 last month. This signals the first expansion after more than six months of mild contraction, signaling that tax cuts and other policies are producing modestly faster growth. Meanwhile, US jobless claims fell to a 49-year low, with claims declining to 202,000 in the week ended March 30. The jobs report showed that hiring rebounded strongly in March following a soft reading in February, easing fears of a dramatic slowdown in the US labor market. In Brexit news, Prime Minister Theresa May has asked the European Union to delay Brexit until June 30, ahead of a key summit next week. This comes after the House of Commons approved legislation that will force Theresa May to seek an extension to the Brexit process to avoid a no-deal scenario on April 12. It was approved at the final stage by 313 votes to 312. European Central Bank officials pressed the case for continued monetary-policy support, stating that the ECB will keep monetary policy loose for as long as needed and could “tweak” its next monetary policy steps if the economic situation merits it. For the week, global equities were stronger. In the US, the Dow Jones (+1.91%), S&P 500 (+2.06%) and Nasdaq (+2.71%) were all positive, whilst the Euro Stoxx 50 (+2.86%), FTSE 100 (+2.30%), Nikkei 225 (+2.84%) and Shanghai Composite (+5.04%) Indices were also stronger. After last weekend’s “no announcement” from Moody’s, the ratings agency subsequently released a report on Tuesday, stating that it expects South Africa’s credit profile to remain in line with those of Baa3-rated sovereigns. Foreigners bought a net R6.8 billion of government bonds by Wednesday after outflows in March. The rand strengthened to R14.10 to the US dollar by week end. Eskom announced that its financial woes are far bigger than previously thought, with a R250bn anticipated shortfall over the next three years, over and above the R69bn injection announced in February’s budget. The board projected that it needed R100bn in debt relief from the government as well as tariff hikes of 17% in 2019 and 15% for the two years thereafter. On an annual basis, the electricity production in South Africa recorded a drop of 1.9% in February. SARS reported preliminary gross tax receipts for F18/19 which were R14.6bn less than the R42.4bn announced in February 2019 budget. The JSE All Share Index ended the week up 2.33%, with industrials (+1.98%), resources (+2.60%) and financials (+3.54%) all stronger, whilst the listed property (-0.34%) sector was slightly weaker. 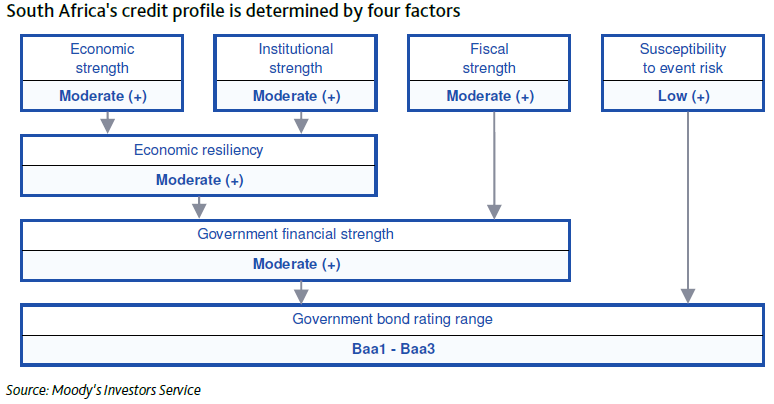 Moody’s credit opinion report released on Tuesday, confirmed South Africa’s credit rating at Baa3 (stable). It stated that SA’s credit profile is supported by a diversified economy, a sound macroeconomic policy framework and a deep pool of domestic investors thanks to well-developed financial sector and markets. Credit constraints include elevated government debt and contingent liabilities risks from state-owned enterprises (SOEs), which limit the capacity of the government to absorb shocks or use fiscal stimulus, as well as persistently low growth. As always, we welcome any feedback on our Weekly Review. The information included above as well as individual companies and/or securities mentioned should not be construed as investment advice, a recommendation to buy or sell or an indication of trading intent on behalf of any Strategiq product. Strategiq Capital is an authorised financial services provider (FSP 46624).